Join us for an unforgettable trip through the unearthly landscape of Havasu Canyon and Havasupai Falls. 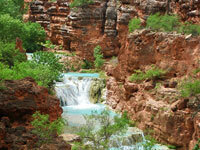 Our guided Havasu Falls hiking tours offer a spectacular Grand Canyon experience. Amazing blue-green waterfalls pour over massive limestone cliffs and hydrate this lush canyon oasis. This adventure begins at Hualapai Hilltop, following a 10 mile trail through beautiful red rock canyons to your awe-inspiring camp below Havasu Falls. En route to our destination we'll pass through towering cliffs, by ancient pictographs, and across pristine streams to Supai Village - the only place in the Grand Canyon still inhabited by native people. Here we'll spend the next few days exploring the depths of this magnificent destination. We can access world-renowned Navajo, Havasu, Mooney and Beaver Falls. These spectacular turquoise waterfalls are heralded by pristine travertine pools, making some of the world's best swimming holes and most spectacular hikes. Our first class coach will depart Los Angeles late evening on Wednesday (4/23) and will arrive at the Southern portion of the Grand Canyon, called Hualapai Hilltop, early in the morning. After loading the pack mules with our food and gear, we will hike hike at 9 ½ miles down the canyon to the campground passing through the isolated Indian village of Supai along our way. The hike will have approximately 2800 of elevation gain/loss. We will camp next to the turquoise colored river; swim in the 70° water, enjoy the Supai Indian Village with a general thrift store and café, and enjoy fantastic scenery. We will spend our time exploring the area by day hiking, enjoying a swim at the base of the waterfall, and basking in the beauty of the Canyon. We will hike back to the bus on Sunday morning and will arrive back in Los Angeles Sunday evening. You just need to bring your own light weight tent (or share one), sleeping bag, reusable dinnerware, and a good attitude. All participants will be expected to help with loading & unloading of gear, campsite setup & clean up, and meal preparation & clean up. Upper Navajo Falls came into being in 2008 when the flood of that year moved massive amounts of rock and mud gouging out a deep bed. The old Navajo Falls was bypassed in the process leaving it dry. New Navajo Falls has one of the same characteristics of its namesake; the creek erupts out of dense vegetation in many different streams to fall about 50' into the pool. This is how the old Navajo Falls behaved at times shifting a lot of its flow through the trees and shrubs to tumble down the rocks in various places across the face of the cliff. Access is not too easy as there are large boulders and rocks just below the falls creating somewhat of a visual barrier, it is passable though. The creek then winds its way down an 1/6th of a mile till it reaches Rock Falls. Rock Falls was the second major waterfall created by mother nature during the flood of 2008 when a massive mud slide caused the creek bed to move. In the process, the creek completely bypassed Navajo Falls which is now dry. (Navajo Falls had been reported to have been destroyed, which is technically not correct - just bypassed by the stream.) Rock Falls is about 30' high and nearly 100' wide and has a nice swimming hole. There is a ledge directly under and behind the falls that many visitors scramble up to jump through the refreshing shower into the crystal clear pool. Havasu Falls is known throughout the world and has appeared in numerous magazines and television shows, and is often included in calendars that feature incredible waterfalls or beautiful scenery. Visitors from all over the world make the trip to Havasupai primarily for Havasu Falls. The vibrant blue water contrasts against the striking red rocks of the canyon walls as Havasu Falls plunges nearly 100 feet into a wide pool of blue-green waters. This, the most striking waterfall in the Grand Canyon, sports a wide sandy beach and plenty of shady cottonwood trees to relax by. Calcium carbonate and magnesium occur naturally in the waters of Havasu Creek. The pools and natural dams form when the calcium carbonate precipitates out of the water and deposits onto rocks, branches, or man made structures (after a devastating flood) building up over time. Havasu Falls and Havasu Creek get their blue color from the magnesium in the water. As the pools deepen and the calcium carbonate is slowly released from the water, the bluer the water appears as the relative magnesium content increases. As the creek originates from a spring, the water rarely deviates from 70 degrees Fahrenheit year round. Mooney Falls is the tallest of the Havasupai waterfalls tumbling over 190' into a large blue pool which is perfect for swimming. Getting to the base of Mooney can be tricky, and requires some patience. Extreme caution is urged when making this descent. The trail to the base of the falls winds down the shoulder of the cliff towards the west canyon wall, and is marked with a worn sign. After a few dozen feet, the trail enters a short tunnel as it continues downward. These tunnels may have been natural caves initially, but have at the least been expanded by man and steps hewn into the rocks. The tunnel emerges onto a ledge where there is a great view of Mooney Falls at about 120' from the bottom. There is a chain in place which should encourage visitors to be safe, as a fall from here would be fatal. The trail ducks into a second tunnel that emerges about 80' above the canyon floor. From there, it is a steep descent along roughhewn steps and there are chains anchored into the rock face to provide hand holds. The chains guide you down to about 15' above the ground, where there are usually two wooden ladders for you to use to traverse the final gap. Caution needs to be exercised at all times as the chains and ladders are constantly sprayed by mist from the waterfall. Beaver Falls is a series of cascades at the conflux of Beaver & Havasu Canyons. To get there, you must climb down to the base of mooney falls, then follow the stream for about 3 miles. The trail crosses the creek several times before reaching Beaver Falls, but is passable. There is no potable water, so you must carry enough water with you. Portable water filters are suggested for emergency use. Getting to Beaver Falls requires some work. You must first navigate the descent to the base of Mooney Falls, then trek 3 miles downstream, crossing the creek multiple times (you will get wet.) The trail is tough to follow at some points, but all that is required is to head downstream. The trail will lead to a point where there appears to be no way to go, that's when you cross the stream. At one point on a rock ledge, there is a rope hanging down (always test ropes you did not place before climbing them). Climb up this rope. It is a difficult climb of around 8 feet, but the rope is located above the water, so any fall will be lessened. Follow the trail up and follow it downstream. There is a rock chute/slide located to your left; this is the difficult access to the falls. There is an easier access point if you hike to the point just before the trail turns north to continue down the canyon. Look for ducks here. River rafters have beaten a path to the ledges where they jump. Go on upstream, gradually working your way to the creek bed. Climb down to the creek and the falls are just upstream. These pools are small, but still offer good swimming. Hike to Beaver Falls which is 4 miles from campground. Pack up and hike back up to Hualapai Hilltop. Depart for Los Angeles.